During his drawing phase, Lu Meng can not draw to flip over the top five cards of the deck and place one card from each suit into his hand. The rest are discarded. Once per turn, Lu Meng can look at another player's hand. He then can choose a heart card from their hand and display it. Lu Meng then either discards that card or puts in on the top of the deck. If Lu Meng activates "Strike at the Heart" on a another player who has no heart cards in their hand, he simply looks at their hand and gives it back to them. When using "Strike at the Heart," Lu Meng does not have to remove a heart card if they have one in their hand. In effect, he can simply use the power to look at another player's hand. When using "Strike at the Heart" on Xiao Qiao, Lu Meng can discard a spade card since her "Beauty" automatically makes these cards heart cards. Lu Meng is not guaranteed to take four cards when using "Study." For example, if Lu Meng uses this power and there are no heart cards in the top five cards of the deck, Lu Meng simply takes a diamond, club, and spade card. When using "Study," Lu Meng must take one card of each suit of the five cards. For example, if there there is only one heart card in the group of five that Lu Meng is not interested in taking, he still must place it in his hand. "Study" gives Lu Meng amazing draw power. It is not at all uncommon for him to get four cards when activating this ability. Even if there are only two suits represented in the top five cards of the deck, Lu Meng still has an advantage over the rest of the characters because he can choose which cards he wants to keep. The only time that using this power would work against him is if the top five cards of the deck are all of the same suit. Anyone who plays poker knows that the probability of this outcome (the equivalent of a flush) is quite small. "Strike at the Heart" is also an amazing power. The advantage of getting to look at an opponent's hand cannot be understated. Lu Meng can use the information that he gains when doing this when deciding whether or not to use a Wine with an Attack. The fact that he can choose to get rid of a heart card is simply icing on the cake. Not only can Lu Meng use "Strike at the Heart" to get rid of a hand card, but he can also use it to fundamentally reduce the drawing power of another player. 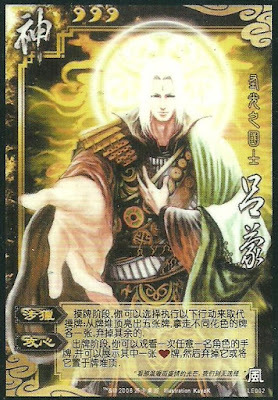 If the play on Lu Meng's immediate right has a heart card that the cannot get rid of easily (like an Escape or Negate), Lu Meng can use "Strike at the Heart" on them each turn to put this card at the top of the deck. Each of their next turns, they will draw two cards, one of them being this heart card that they cannot get rid of. Lu Meng is perhaps one of the most fragile of the demigod characters. He has only three health and no inherently defensive abilities. To make matters worse, he is a very high-profile character. Enemies will hone in on him and try to destroy him as quickly as possible. "Study" is not without its disadvantages. While it offers amazing draw power, Lu Meng has to flip the five cards from which he is selecting face up. All of the other players will get to see what he is drawing, and as a result, what he is not drawing. For example, if Lu Meng does not get any Escapes an enemy will use Wine when Attacking him without a second thought because they know he cannot block it. "Strike at the Heart" has a minor flaw - enemies will do whatever they can to rid their hand of heart cards so Lu Meng cannot discard any hand cards when using this power against them. While this is not a game-breaking flaw for Lu Meng, it can make this power slightly less effective. Liu Bei/Guo Jia/Xun Yu - These characters can give Lu Meng cards that the rest of the characters cannot see. This helps to mitigate the second bullet point in the 'Weaknesses' section. Lu Bu/Xu Chu/Zhang Jiao/Dong Zhou/Zhang Fei - The characters can do a large amount of damage in a short amount of time. Due to his lack of defensive abilities, Lu Meng can easily fall prey to these offensive powerhouses. Xu Huang - Xu Huang's "Blockade" is damning against Lu Meng since it robs him of his drawing power. King Lu Meng is an okay, but not an outstanding king choice. He benefits from the extra unit of health and his powers are valuable when fighting rebels. In addition, it is sometimes possible to 'bully' the spy into acting as a loyalist, lest they feel the wrath of Lu Meng! However, his fragile nature and his lack of defensive abilities make it easier for rebels to damage him. Loyalist Lu Meng makes for a good loyalist. His outstanding offensive powers can do a small amount of damage in a short amount of time. Also, his presence can act as a distraction for the rebels, drawing their fire from the king. Rebel Lu Meng is a good rebel choice. He can focus his powers on the king and deal a lot of damage. However, it should be noted that he could die quickly since everyone who is not a rebel will want him dead, since he will usually be the biggest threat of the rebels. Additionally, the three card bounty will provide an additional incentive to kill him. Spy Lu Meng is a serviceable, but flawed spy choice. He can affect the game quickly to even the balance between the two teams. However, his fragile nature and the fact that he is a high-profile character work against him when trying to last a long time. Lu Meng is perhaps one of the most fun characters to use. He is very powerful character in terms of draw power and fire power. However, do not let this power go to your head when using him. Sometimes it is better to keep a low profile if you want to last longer.